United Launch Alliance have conducted the United States’ first orbital launch of the year on Thursday, when their Delta IV launched with the fourth Wideband Global Satcom spacecraft. Liftoff from SLC-37B at the Cape Canaveral Air Force Station was on schedule for the beginning of a 93-minute launch window which opened at 19:38 local time (00:38 on Friday in UTC). Wideband Global Satcom, or WGS, is one of three next-generation communications systems being introduced by the US military, along with the Advanced Extremely High Frequency (AEHF) and Mobile User Objective System (MUOS). Originally named Wideband Gapfiller Satellite, WGS was originally conceived as a temporary replacement for the aging Milstar system, until AEHF became operational. However, its primary mission has become supplementing and eventually replacing the Defense Satellite communications System, or DSCS. Having started as a US programme, WGS has grown to include several other countries, including Australia, New Zealand, Canada, Denmark, the Netherlands and Luxembourg. The WGS-4 satellite is first Block II WGS satellite, a modification on the original series which incorporates a new bypass system which triples the rate at which reconnaissance aircraft can relay images via the system. Three Block I WGS satellites are already in orbit; WGS-1 or USA-195 was launched by an Atlas V 421 in October 2007, with WGS-2, or USA-204, following in April 2009, also on an Atlas. 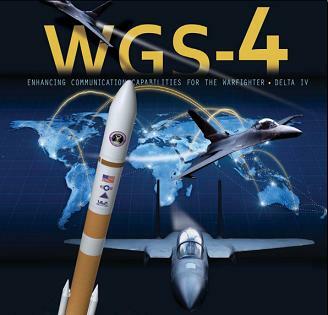 In December 2009, WGS-3 or USA-211 was launched on the first flight of the Delta IV-M+(5,4). Including those already on orbit, current plans call for nine WGS satellites to be launched, with a tenth expected to be ordered in the near future. Each satellite has a mass of 5,990 kilograms, and is capable of receiving and transmitting data on frequencies of 500 megahertz and 1 gigahertz, at rates of up to 3.6 gigabits per second. Each spacecraft can cover 19 areas simultaneously, with eight steerable x-band transponders and ten steerable ka-band transponders. 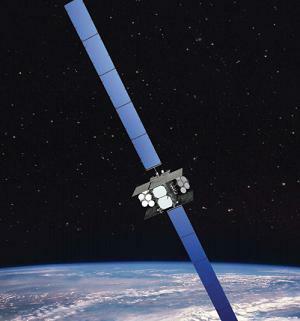 Boeing is the prime contractor for WGS, with the satellites being based around its BSS-702 satellite bus. Each spacecraft is equipped with an R-4D apogee motor for orbit raising and circularisation manoeuvres, and four XIPS-25 ion engines which will be also be used for orbit circularisation, as well as stationkeeping in geosynchronous orbit. The satellite will use a pair of solar arrays, equipped with gallium arsenide cells, to generate power. The satellite will be controlled by the US Air Force’s Third Space Operations Squadron, which is based at Schriever Air Force Base in Colorado. The Delta IV used to launch WGS-4 is Delta 358. Unusually, the rocket’s flight or “Delta number”, has not been painted on the rocket – the number is usually present within a blue triangle on the interstage which symbolises the Delta series of rockets, however on Delta 358 this triangle has been left blank. Delta 358 was a Delta IV Medium+(5,4) rocket, consisting of a Common Booster Core first stage, with four GEM-60 solid rocket motors, and a five metre Delta Cryogenic Second Stage. The largest of the Delta IV Medium+ configurations, the (5,4) has only flown once before; deploying the last WGS satellite in December 2009. The Common Core Booster is a cryogenically-fuelled stage, powered by a single RS-68 engine, burning liquid hydrogen and liquid oxygen. The main engine will ignite five and a half seconds ahead of launch, followed by the solid rocket motors two hundredths of a second before the countdown reaches zero. The solid rocket motors provide additional thrust during early ascent, with two also being equipped with moveable nozzles for thrust vectoring, contributing to the vehicle’s attitude control during the initial stages of the flight. 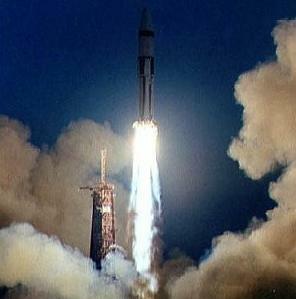 At T-0, Delta 358 lifted off from Space Launch Complex 37, and begin its ascent towards orbit. Seven seconds later, it began a manoeuvre to attain an azimuth of 100.97 degrees out over the Atlantic Ocean, and pitched over to attain its planned ascent trajectory. At around 36 seconds after launch, the rocket passed through the sound barrier, and 50.1 seconds into its flight it passed through max-Q, the area of maximum dynamic pressure. The GEM-60 motors burnt out in pairs at 93.1 and 93.3 seconds after launch, with the thrust-vectoring pair being last to burn out. The two motors with fixed nozzles separated from the first stage 100 seconds into the flight, with the others following 2.35 seconds later. Three minutes and 27 seconds after launch, the payload fairing separated from around the satellite. The fairing protects the spacecraft during its ascent through the atmosphere, but is no longer needed in space where the particle density is far lower. The Delta IV-M+(5,4) uses a payload fairing which is a little over eight metres long, and has a diameter of five metres. Just under forty seconds after the fairing separates, the RS-68 shut down, having completed the first stage burn. Eight seconds later, the first and second stages separated by means of sixteen pneumatic actuators. The second stage, or DCSS, is fuelled by the same cryogenic propellants as the first stage. It is powered by an RL10B-2 engine, with an extendable nozzle. Following separation, the nozzle deployed, before the engine ignited 13 seconds after staging to begin the first of two burns. This first burn lasted 16 minutes and 15.9 seconds, placing the vehicle into an initial parking orbit for a brief coast phase. This coast lasted for just seven minutes and 44.6 seconds, before the RL10 ignited again for its second burn. After firing for another three minutes and 8.3 seconds, the RL10 again cut off, completing powered ascent. Nine minutes and 6.2 seconds after the completion of the second burn, or 40 minutes and 42 seconds after launch, the WGS-4 satellite was separated from the DCSS. 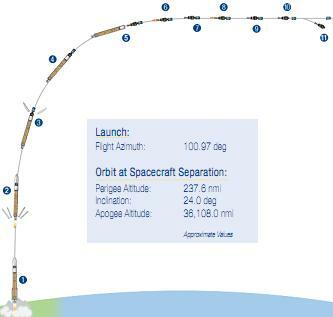 According to United Launch Alliance, the target orbit at spacecraft separation will be one with a perigee of 440 kilometres, an apogee of 66,870 kilometres, and an inclination of 24 degrees to the equator. WGS-4 manoeuvred from this supersynchronous transfer orbit into its operational geosynchronous orbit. Three minutes after spacecraft separation, the DCSS began a collision avoidance manoeuvre, which lasted about three minutes and 48 seconds. About half an hour later the upper stage will be safed with propellant tank blowdown, and a hydrazine depletion manoeuvre. Delta IV launches from Cape Canaveral are conducted from Space Launch Complex 37B. Originally built in the 1960s as a backup launch complex for the Apollo programme, it was used to test hardware which would be used in the moon landings. The first launch from the complex was of SA-5, the first all-up test of the Saturn I, and the first orbital launch of a Saturn rocket, on 29 January 1964. The original Launch Complex 37 consisted of two pads, but with a single mobile service tower (MST) which could be moved between the two pads. Pad A was never used, whilst pad B, the same pad used by the Delta IV, was used by six Saturn I rockets followed by two Saturn IBs. The last launch from the complex came in January 1968, when a Saturn IB launched Apollo 5; the first test flight of the Lunar Module in Earth orbit. Following the launch of Apollo 5, LC-37 was mothballed along with Launch Complex 34 ahead of the Apollo Applications programme, which would have seen additional flights of the Apollo spacecraft to Low Earth orbit, which would have made use of the Saturn IB. Of all the Applications proposals, only one ever flew; Skylab. With only three manned flights required to support this, it was decided that it would be cheaper to convert Launch Complex 39 to accommodate the Saturn IB than to reactivate either LC-34 or LC-37, and the complex was demolished in the 1970s. In the late 1990s, the site of the former Saturn launch complex was selected for use by the Delta IV, and rebuilt to support it. The new complex was first used for the maiden flight of the Delta IV, which occurred in 2002. Delta 358 will be the fifteenth Delta IV to use the complex, and the twenty-first launch from it overall. Delta IV launches are conducted by United Launch Alliance, a company formed to operate the Delta II, Delta IV and Atlas V rockets on behalf of the US Government, Lockheed Martin and Boeing. The launch of WGS-4 was the 57th launch to be conducted by ULA since it formed in December 2006. 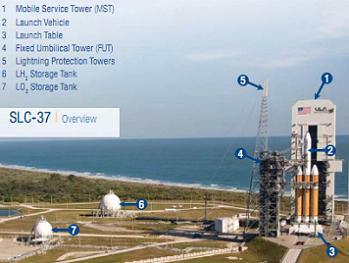 ULA is aiming to conduct eleven Delta IV and Atlas V launches in 2012. The launch of WGS-4 was the first orbital launch to be conducted by the United States this year. Last year the USA conducted 18 launches, with 17 successful and one failure, however it was overtaken by China in terms of total launches for the first time. The next US orbital launch is currently scheduled for 16 February, when an Atlas V 551 will orbit the first MUOS communications satellite. 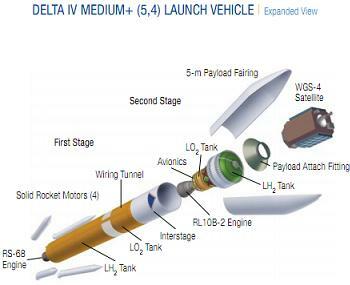 The next Delta IV launch is expected to occur in March, when the first Delta IV-M+(5,2) will launch from Vandenberg, carrying the NROL-25 mission for the US National Reconnaissance Office. The next WGS satellite is expected to launch in about a year’s time, also aboard a Delta IV.